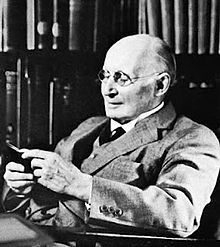 As we prick up our ears, we might send thoughtful birthday greetings to Alfred North Whitehead; he was born on this date in 1861. Whitehead began his career as a mathematician and logician, perhaps most famously co-authoring (with his former student, Bertrand Russell), the three-volume Principia Mathematica (1910–13), one of the twentieth century’s most important works in mathematical logic. But in the late teens and early 20s, Whitehead shifted his focus to philosophy, the central result of which was a new field called process philosophy, which has found application in a wide variety of disciplines (e.g., ecology, theology, education, physics, biology, economics, and psychology).